Flatiron Books, 2017. 305 pages. I’ll confess right up front that I don’t really feel like I used this book as it was intended – and yet I still got wonderful things out of it. The book includes meditation exercises at the end of each chapter. They sound like great exercises. I didn’t take up meditation and didn’t do the exercises. But the book also gave me profound things to think about and things to notice and encouraged me to be more mindful in my everyday life. I’ve got a big list of pages with quotations I’m going to post on my Sonderquotes blog – There’s so much wisdom here! I hesitate to pick up a book with love in the title, since I live alone and am not in a relationship. This book isn’t just about romantic love, though. It’s about real love, the kind of love that touches your life every single day. Even lovingkindness for people you walk past on the street. 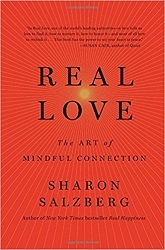 This book is an exploration of real love – the innate capacity we each have to love – in everyday life. I see real love as the most fundamental of our innate capacities, never destroyed no matter what we might have gone through or might yet go through. It may be buried, obscured from view, hard to find, and hard to trust . . . but it is there. Faintly pulsing, like a heartbeat, beneath the words we use to greet one another, as we ponder how to critique others’ work without hurting them, as we gather the courage to stand up for ourselves or realize we have to let go of a relationship – real love seeks to find authentic life, to uncurl and blossom. I believe that there is only one kind of love -- real love -- trying to come alive in us despite our limiting assumptions, the distortions of our culture, and the habits of fear, self-condemnation, and isolation that we tend to acquire just by living a life. All of us have the capacity to experience real love. When we see love from this expanded perspective, we can find it in the smallest moments of connection: with a clerk in the grocery store, a child, a pet, a walk in the woods. We can find it within ourselves. Real love comes with a powerful recognition that we are fully alive and whole, despite our wounds or our fears or our loneliness. It is a state where we allow ourselves to be seen clearly by ourselves and by others, and in turn, we offer clear seeing to the world around us. It is a love that heals. Our exploration begins with that often-forgotten recipient who is missing real love: ourselves. We expand the exploration to include working with lovers, parents, spouses, children, best friends, and work friends, divorce, dying, forgiveness – the challenges and opportunities of daily life. And we move on to exploring the possibility of abiding in a sense of profound connection to all beings, even those around whom we draw strong boundaries or have tried in the past to block. We may not at all like them, but we can wish them to be free (and us to be free of their actions defining us). This vast sense of interconnection, within and without, leads us to love life itself. I am writing this book for all who find that yearning within to be happier, who dare to imagine they might be capable of much, much more in the matter of love. And I am writing for those who at times suffer in feeling, as I once did, unloved and incapable of changing their fate. My hope is that through this book I can help you cultivate real love, that beautiful space of caring where you come into harmony with all of your life. Reading a little bit from this book each day left me inspired and energized. Check out the quotes I chose on Sonderquotes, and if those speak to you, there’s a lot more where they came from. This book is about becoming a more loving person.